In February the band welcomes new member to its ranks – keyboardist and dulcimerist Surm, who previously recorded some native instruments parts on "Verity" as session member. Varggoth with other veterans of Kharkiv scene forms old school death metal band NECROM and works on its material. The new full-length record of the band entitled "Істина" ("Verity") is finally released on CD through Oriana Music and on double vinyl LP through Heritage Recordings. More dark and introspective, than its glorious predecessor from 2009, "Verity" leads the listener deep into the realms of ancient pre-pagan cults, where the one could obtain the simple and grim truths of existence in solitude and straight dialogue with nature and forces that came from far beyond the human world. At the same time the basis for NOKTURNAL MORTUM music here is the one that cemented the whole legacy of the band in one frame: noble Epic Heathen Metal Art with roar of guitars and rumble of drums supported magnificent keyboard and traditional instruments arrangements. These elements create unique and unmistakable sound of the band, always bringing forth the strong and deep feelings. The record was created with help of many session musicians, and keyboardist Hyozt is listed as full-force member of the band on this album. "Verity" was met with listener’s and critical acclaim and even won in "Best Album of the Year" category at Best Ukrainian Metal Act Awards in the end of the year. On 15th of February new Polish label Heritage Recordings releases two new NOKTURNAL MORTUM records. First of them is "22 Years Among the Sheep", 5CD anniversary compilation which consists of two discs with material of the band (rarities and most significant songs through their whole career) and three discs which contain tribute to NOKTURNAL MORTUM from bands all around the globe. The second release is "The Spirit Never Dies", split CD with cult Polish project GRAVELAND, which was announced long time before. Ukrainians are presented here with three tracks (instrumental intro and two songs) made in experimental style: many listeners were surprised with absence of native instruments in arrangements. The song entitled "Eastern Breakdown" became the songwriter’s debut in NOKTURNAL MORTUM for Jurgis. Also the poem of modern Ukrainian poet Dmytro Savchenko was used for it as lyrics. The huge part of keyboards on this record were done by old friend of the band, Hyozt from REUSMARKT. Band performs live and works in the studio. New version of "Hailed Be the Heroes!" with vocals of Arseniy Bilodub is included in "Сталевий промінь волі" ("The Steel Ray of Freedom") CD-compilation in support of volunteer battalions in Ukrainian army. Saturious and Aywar leave the band. This is mutual decision, present and former members of the band stay on good terms. Two new musicians join the ranks of Nokturnal Mortum: guitarist Jurgis (also in Khors) and bassist Rutnar (also in Ivory Mist, Till Dawn). Osmose Productions releases the vinyl version of “Kolovorot” as triple LP in black and grey editions. The band returns to concert activity and works on new material. In March French label Osmose Productions releases the vinyl version of “The Voice of Steel” as double LP in two editions: black and orange fire ones. Also Osmose Productions plans to release the other works of NOKTURNAL MORTUM. In May British label Godreah Records releases tribute to BATHORY entitled “Voices from Valhalla – A Tribute to Bathory” where NOKTURNAL MORTUM is presented with their version of classic “Valhalla”. Oriana Music and Musical-Hall Distribution release video version of “Kolovorot” in digi-DVD format. There are brand new changes in line-up of NOKTURNAL MORTUM: Vrolok leaves the band and not so long after him Astargh quits too. Aywar becomes new guitarist of NOKTURNAL MORTUM, while Saturious handles not only keyboards, but bass guitar as well. On 16th of November Oriana Music releases live album “Kolovorot”, double digi-CD which includes the bands performance at the last instalment of the festival of the same name from 2010. The band actively tours in Europe. The year ends with Kolovorot XII fest. NOKTURNAL MORTUM plays on the second day of the two-day event finishing the glorious history of the festival and presenting the huge set-list which covers the bands concert staples of the last years. This show is filmed and recorded for DVD and live album. In February No Colours Records releases official live bootleg “Live in Katowice” as regular DVD, DVD + CD and digi-DVD. The video quality of this concert suits the bootleg status, therefore it can be interesting for die-hard fans of the band. In April Odalv leaves and Bairoth becomes the new drummer of NOKTURNAL MORTUM. In May No Colours Records re-releases “Lunar Poetry” as A5 digi-CD. The band works hard on new full-length album. On 26th of December new album entitled “The Voice of Steel” is presented at Kolovorot Fest in Kharkiv. That evening actually is a premiere of CD version of this record released through Oriana Music. “The Voice of Steel” demonstrates the bands journey into new musical dimensions: both critics and fans notice the symbiosis of original NOKTURNAL MORTUM style with influences of progressive and post-rock. The scale and richness of the whole music spectre together with flawless professional performance make this record one of the most ambitious and greatest records in history of heathen ideology based metal music. “The Voice of Steel” is considered by many as the best work of NOKTURNAL MORTUM to date. Alzeth leaves the band and Astargh (ex-VEIL OF SIN, later ELDERBLOOD) becomes the new guitarist of NOKTURNAL MORTUM. In September Polish label Hammerbolt Productions releases four-way split-CD “Eastern Hammer” which demonstrates the spiritual unity of leading heathen metal bands from Slavic lands. NOKTURNAL MORTUM share this record with GRAVELAND, TEMNOZOR and NORTH, each band presenting one song. Ukrainians recorded for this split the new version of their old song “Kolyada” (initially from “Goat Horns” album). This new version already has been played at many gigs and still is concert staple of the band. Old songs of the band appear on different compilations: cover of GRAVELAND’s “Thurisaz” is included in “Chronicles of Tyranny & Blood [Tribute to Graveland]” released through Totenkopf Propaganda Records; “The Night Before the Fight” is included in “THE DARK PSYCHE: An Aural Exhibition of Black Metal from Top Scholars in the Genre” by The End Records. No Colours Records releases the English-language version of new album entitled “Weltanschauung” as CD, collectors A5 digibook-CD and as 3-LP vinyl (with “The Taste of Victory” EP as bonus part). Simultaneously Oriana Music releases the CD-version of the same album with Russian and Ukrainian lyrics entitled “Мировоззрение” (“Mirovozzrenie”). Both versions of the album differ from each other not only with lyrics, but also with instrumental interludes between the songs. “Weltanscauung” is a heathen metal opus of epic scales performed on highest level that spawned such NOKTURNAL MORTUM concert staples like eponymous song or “Hailed Be the Heroes”. At the same time No Colours Records together with Oriana Music release on vinyl such albums as “Lunar Poetry”, “To the Gates of Blasphemous Fire” and “Goat Horns”. The band starts to perform at gigs the songs from forthcoming record like “Valkyrie” or “Ukraine” and plays many shows, including the one in Polish Katowice that later will be released on DVD as “Live in Katowice” official bootleg. Oriana Music releases CD re-editions of “Return of the Vampire Lord/Marble Moon”, “Twilightfall”, “Nechrist”, “To the Gates of Blasphemous Fire”, “Goat Horns” and “Lunar Poetry”. New editions differ from old ones with new design and special bonus-tracks (“Nechrist”, “To the Gates of Blasphemous Fire” and “Goat Horns” are enhanced with covers of MOTORHEAD, SLAYER and WASP respectively, while “Lunar Poetry” is supplemented with rehearsal tape “Black Clouds Over Slavonic Lands” recorded in 1995 which includes songs which were overworked later and became the part of “Lunar Poetry”). At the same time Lithuanian label Ledo Takas Records releases “Nechrist” double LP (enhanced with two live bonus-tracks, it becomes a first NOKTURNAL MORTUM album to have vinyl treatment). The band signs to famous German No Colours Records. The new album is fully recorded in two versions (“Weltanschauung” in English and “Мировоззрение” in Russian and Ukrainian) and planned to be released this year. However, due to different circumstances it is pushed back to 2005. In April Odalv (ex-SVYATOGOR, RUNES OF DIANCEHT, MUNRUTHEL) becomes the new drummer of the band. In order to relieve the waiting of a new full-length album Oriana Music releases 43-minute EP “The Taste of Victory” which includes three songs from yet to be released “Weltanschauung” (with special mixing for this record that differs from mixing for “Weltanschauung”) and epic “As the Steel Eagle into Golden Svarga” recorded back in 2001. Three new compositions show the musical development of NOKTURNAL MORTUM in vein of monumental heathen metal art, while “As the Steel Eagle into Golden Svarga” contain atmospheric black metal part in the manner of bands earlier days as well as pure folk conclusion of the composition. American label Unholy Records releases “Eleven Years Among the Sheep”, double disc compilation that includes not only songs of NOKTURNAL MORTUM but also a material of SUPPURATION and CRYSTALINE DARKNESS. In Spring the work on new album entitled “Weltanschauung” starts, a few songs from it are performed at gigs yet. In July Xaarquath leaves the band and Vrolok takes the bass player duties. Alzeth (who previously played in HATE FOREST and NAGUAL) becomes the second guitarist in NOKTURNAL MORTUM. American label Unholy Records releases “Visions: A Tribute to Burzum” compilation which includes version of “My Journey to the Stars” by NOKTURNAL MORTUM. In December Munruthel leaves the band for good. Oriana Music releases on tape the compilation “Return of the Vampire Lord/Marble Moon” that includes both mentioned EP’s and two covers recorded this year – “My Journey to the Stars” initially by BURZUM and “Thurisaz” initially by GRAVELAND. Both covers are considered to belong to the best interpretations of these black metal classics by many fans. Besides this Varggoth and Saturious record new fifteen-minute composition entitled “As the Steel Eagle into Golden Svarga”. This epic composition is planned to be the part of split with Polish ambient-folk project WOJNAR, but the release of split is cancelled due to problems with the label which was going to release it. At the same time members of NOKTURNAL MORTUM work on their own projects: Saturious on FINIST and Munruthel on solo album under his own name. The year starts with loss: in spring Munruthel leaves the band. As a sign of solidarity with him Saturious leaves NOKTURNAL MORTUM too. On 4th of July The End Records releases CD version of “Nechrist”. The band makes everything possible to cease the contract with Nuclear Blast Records and successfully reaches the goal. As result European distribution of the album is held by German Last Episode Records. In spite of bands will labels don’t print the lyrics in CD booklet (though lyrics are available on tape edition and will be available later on CD edition by Oriana Music). Vrolok from RUNES OF DIANCEHT joins NOKTURNAL MORTUM as second guitarist. Meanwhile group searches for drummer, but in the end of the year Munruthel returns to band and Saturious returns after that too. In January Karpath leaves the band, Varggoth becomes the only guitarist in NOKTURNAL MORTUM. On March 1st The End Records releases the CD version of “To the Gates of Blasphemous Fire” with European distribution through Nuclear Blast Records. In May band records new album “Nechrist” in Beat Studio. Soon the tape version if new record is released (together with new edition of “Lunar Poetry”) on Oriana Music. “Nechrist” contains ten songs (five in English and five in Russian) including the new interpretation of bands own “Perun’s Celestial Silver” from “Lunar Poetry”. The new album shows the world barbaric and militant heathen black metal where powerful symphonic arrangements meet the warlike Slavic melodies. The huge arsenal of folk instruments as well as female backing vocals are performed by DRABYNA, the professional Ukrainian folk music ensemble. It becomes one of the components of albums individuality and high quality. In June The End Records releases the second album of MISTIGO VARGGOTH DARKESTRA called “The Key to the Gates of Apokalypse”. 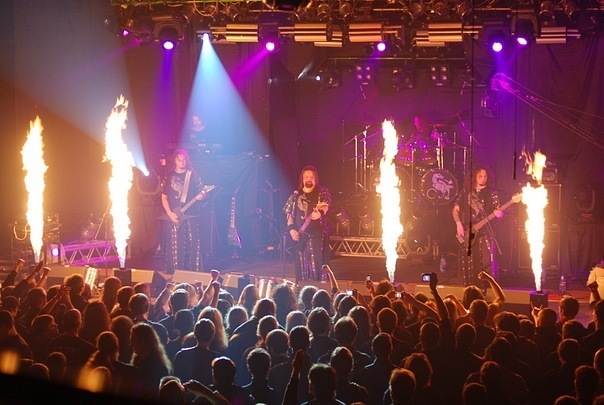 The new album of a project is a one huge 72-minute song – thus it is possible to speak about “The Key to the Gates of Apokalypse” as one of the longest songs in history of heavy music. This work is inspired by Varggoth’s occult experience and demonstrates the symbiosis of dark ambient and atmospheric black metal. Album never has been re-released on CD after that, thus The End Records edition became a true rarity as for now. In September “Perun’s Celestial Silver” is included in another one label’s compilation, “White: Nightmares in the End”. In January band signs contract with American label The End Records (including European distribution through Nuclear Blast Records). “Goat Horns” becomes the first NOKTURNAL MORTUM record on new label: the CD version of the album is released on 31st of March. Besides that one of the songs from “Goat Horns”, “Unholy Orathania”, is included in “…Until the End of Time” compilation which presents the bands signed to The End Records. Varggoth founds his own label Oriana Music and releases on it tape with eponymous mini-album of VECHE that was recorded back in 1996. This is the only record made by this project and it contains 30 minutes of quite unusual mix between ambient, electronic music and atmospheric black metal. And, like many records of NOKTURNAL MORTUM, VECHE is a one-of-a-kind album with no clear counterparts among the whole world underground scene. After that during 1998 Oriana Music releases two tapes: the re-edition of “Goat Horns” and new album “To the Gates of Blasphemous Fire”. Unlike “Lunar Poetry” and “Goat Horns” with their melodic approach and atmosphere described by The End Records as lunar black metal, “To the Gates of Blasphemous Fire” shows much more aggressive, evil and chaotic sound while still remaining symphonic black metal. Few tracks like instrumental “Cheremosh” or concluding “The Forgotten Ages of Victories” with its warlike lyrics demonstrate the direction which band would follow on the next records. The album is dedicated to Igor Naumchuk, the ideologist behind then-friends of NOKTURNAL MORTUM – LUCIFUGUM. 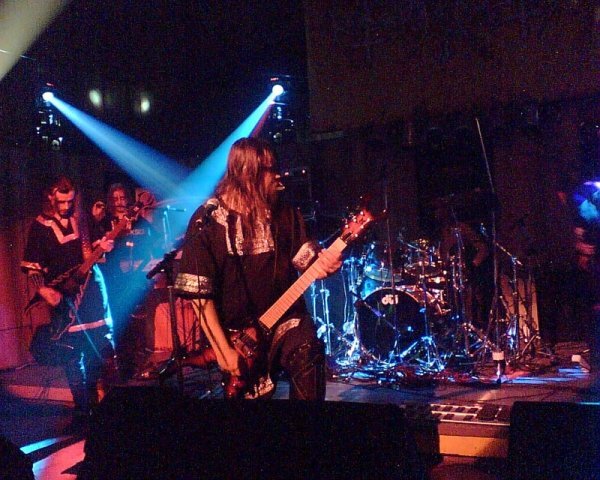 Another one important event happens in December: band plays at first Kolovorot Fest in Kharkiv, which will become one of the greatest and long-remaining pagan metal musical festivals all over the world. Polish label Morbid Noizz releases tape version of “Lunar Poetry” exposing this album to European listener. Metal Agen Records release the tape version of “Goat Horns”. New album continues what was started on “Lunar Poetry”, this time with more rich symphonic arrangements and extensive use of Ukrainian folk instruments. The first and latter editions of this record don’t contain the lyrics. They are lost as for now and not available for fans because of that. The same applies to “Twilightfall”, “Lunar Poetry” and “Return of Vampire Lord” (the composition in vein of “Goat Horns” and “Lunar Poetry”). Together with two tracks from “Mi Agama Khaz Mifisto” demo this composition is released on Metal Agen Records as part of split tape with LUCIFUGUM entitled “Path of the Wolf/Return of the Vampire Lord”. NOKTURNAL MORTUM returns to studio work: in Beat Studio (Kharkiv) band records full-length album “To the Gates of Blasphemous Fire” and “Marble Moon” EP. This mini-album is self-released on tape in June. Actually it is a collection of different stuff: it contains bands own instrumental version of Ukrainian National anthem, demo-versions of two songs from yet to be released “To the Gates of Blasphemous Fire” and three covers: “Family Vault” (originally by Italian cult DEATH SS) and two versions of Ukrainian Cossacks song “Ластівка” (“Swallow”). Few songs of NOKTURNAL MORTUM appear in different compilations: “Perun’s Celestial Silver” and “Swallow” are included in “Unto A Long Glory... Beverina Compilation 2” and “Unto A Long Glory... Beverina Compilation 3” respectively which are released through Latvian Beverina Productions. Metal Agen Records release “Midnight Fullmoon”, the debut album of MISTIGO VARGGOTH DARKESTRA, Varggoth’s ambient project. This year becomes one of the most fertile and important in history of the group. In spring “Lunar Poetry is released on tape through Russian label Metal Agen Records which has a large distribution network all across the ex-USSR territory. Melodic black metal with rich key arrangements and unmistakable touch of Ukrainian folklore added to melodies turns many new listeners to band and brings Nokturnal Mortum real success among underground audience. Band starts concert activity. Soon Wortherax leaves but no longer than this year he is replaced with Karpath who comes from disbanded CRYSTALINE DARKNESS. Saturious (who previously played in local band RENEWAL) joins NOKTURNAL MORTUM line-up as second keyboardist. In Summer band starts the recording of the next full-length record entitled “Goat Horns” at home studio of Vasiliy Haschina aka W. Angel who also performs clean vocals in one of the compositions, “Kolyada”. Also this year marks the creation of VECHE, the only album joint project between NOKTURNAL MORTUM and LUCIFUGUM, black metal band from Zhitomir. The whole EP is composed and recorded during one day when Varggoth, Saturious and Munruthel visit LUCIFUGUM members in Zhitomir. In December NOKTURNAL MORTUM record new epic composition “Return of the Vampire Lord” which, like VECHE EP, will be released in 1997. The band makes the historical decision about changing “C” letter in the name to “K”. It adds to NOKTURNAL MORTUM name full authenticity and excludes the possibility of name coincidence with any other band. The recording of “Twilightfall” is finished and band self-releases it on tape. This record can be considered as the most questionable album in history of NOKTURNAL MORTUM in terms of style definition: “Twilightfall” balances somewhere between melodic forms of doom, death and gothic metal with prominent use of Ukrainian folk melodies (bands trademark that would be developed further on later works). NOKTURNAL MORTUL will never sound again like they do on “Twilightfall” after this record. Due to its originality and individuality “Twilightfall” can be considered as one-of-a-kind album not only in discography of NOKTURNAL MORTUM, but among all versatility of nineties metal music as well. In the end of the year band records the next full-length demo album, “Lunar Poetry”. Varggoth and Munruthel leave CRYSTALINE DARKNESS and form NOCTURNAL MORTUM (with “C” in the band name). The line-up of the band includes Varggoth (guitars and vocals), Munruthel (drums), Sataroth (now he becomes keyboardist), Wortherax (guitars) and Xaarquath (bass). The group starts working on its first full-length demo-record “Twilightfall”. Occasionally the first version of this album is destroyed, but the band does not give up and records all material for the second time. SUPPURATION record new demo entitled “Unspeakable Journey into Subconscious World” at St. Maybe Soundfactory Studio. In April Edward Pichugin leaves the band. The guitarist vacancy is replaced with Wortherax (ex-SCAREGROW). In May band visits Moscow and records “Cosmic Flight Around Astralspher” 7” EP initially planned to be released through Russian The Final Holocaust Records as a split with Finnish band MORNING STAR. Unfortunately label becomes bankrupt. As result records made by SUPPURATION in 1993 are not released officially. Later few compositions from these recording sessions will be included in “Eleven Years Among the Sheep” compilation. In summer SUPPURATION splits up, but upon the ruins of old band rises the new one – CRYSTALINE DARKNESS. It includes Varggoth (vocals, guitar), Karpath (guitar) and Munruthel (drums). Not only the name, but also the music changes: CRYSTALINE DARKNESS record 2-song demo “Mi Agama Khaz Mifisto” in vein of black metal. However the unique style of NOKTURNAL MORTUM will be formed later. This demo record is not released officially too: the band negotiates with View Beyond Records without any result. Later “Mi Agama Khaz Mifisto” will become the part of “Return of the Vampire Lord” EP. SUPPURATION record debut demo album “Ecclesiastical Blasphemy” in Kkarkiv St. Maybe Soundfactory Studio. The demo contains raw and fierce death metal perfectly fitting in underground scene of those years. The album is released on tape through Belgian Shiver Records. SUPPURATION is joined by two new members – guitarist Edward Pichugin and then-vocalist Sataroth from SMILE OF DEATH. Varggoth leaves the vocal duties and becomes the guitarist only. The history of the band starts in Kharkiv metal underground. In December Varggoth leaves LEPROSY. On 31st of December he forms death metal band SUPPURATION consisting of him (guitars, vocals), Munruthel (drums) and Xaarquath (bass). SUPPURATION can be considered a pre-NOKTURNAL MORTUM band, because all three members later will participate in the group.